The resource kit is predominantly for teachers as an aid to setting up environmental projects in schools. The resource covers four areas; the Catchpool Valley, Orongorongo Valley, Turakirae Head and the Rimutaka Incline. For each area there are curriculum linked, pre-trip, on site and post-trip activities. These are supported by 18 fact sheets and a set of laminated activity cards for student use while visiting the areas. 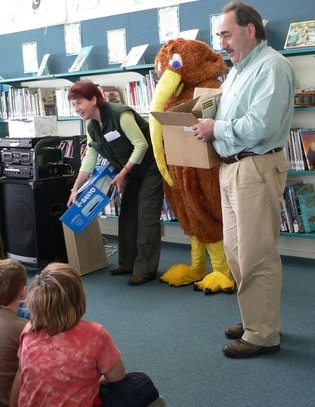 Members of the Remutaka Conservation Trust have a strong interest in educating our local school children about what we do and why conservation of our native flora and fauna is so important. Photo credit: Margaret Willard.